This week, I broke the half-century mark. Professionally, the last 25 years have been spent neck-deep in the financial industry. Hopefully, I learned a few things along the way. D. J. Lewis is First Sr. Vice President, Business Bank of Texas, N.A. D.J. 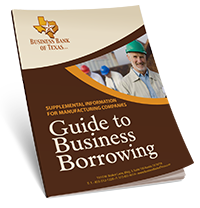 is responsible for business development and relationship management for Business Bank of Texas, N.A. He graduated in 1993 from the University of Houston with a BBA in Accounting. While attending college he started his career in banking working at a small Savings and Loan. In 1991 that same Savings and Loan was acquired by a large national bank. Soon after the acquisition, D.J. took advantage of an opportunity to transfer to Austin where he has called home for the past 15 years. After 19 years with a large national bank D. J. was presented with another opportunity and made the decision in October 2010 to start a career with Business Bank of Texas, N.A. D. J.’s 22 years of banking experience includes 7 years in bank operations, 6 years as a Branch Manager, 6 years as a Commercial Lender, and 3 years as a SBA Lender. At some point in every growing business, it becomes apparent that moving forward will require raising cash. Whether it’s to buy or replace equipment and other assets, hire new staff, move to a bigger facility, or any of the other elements that come into play when a company is expanding, business owners often find themselves at a crossroads. John F. Dini is a consultant and coach to hundreds of business owners, CEOs and Presidents of companies with over 11,000 hours of delivering face-to-face, personal advice to entrepreneurs. He is the author of three business books including Beating the Boomer Bust and 11 Things You Absolutely Need to Know About Selling Your Business, now in its second edition. He is a serial entrepreneur, but prefers the term “chronically unemployable.” John holds a BS in accounting from Rutgers University, and an MBA from Pepperdine University, and has six additional certifications in exit planning, business brokerage, behavioral analysis, medical practice management, facilitation and coaching. John writes numerous articles on small business topics for newspapers, magazines, and in his own blog at www.awakeat2oclock.com. He speaks frequently to business groups and national associations, and is a 15-year member of Jim Blasingame’s “Braintrust,” appearing regularly on “The Small Business Advocate,” a nationally syndicated radio program, as an expert in the issues of business ownership. His latest book, Hunting in a Farmer’s World: Celebrating the Mind of an Entrepreneur, has won recognition including “Best Business Book” at the New York Book Festival and the National Silver Medal for business books from the Independent Publishers’ Association. Great employees are a wonderful asset, but their individual heroics may not be healthy for your company. Sooner or later you will move on from your business. When you begin planning for your transition, what will your company systems sound like when described to a critical buyer? Last month we discussed understanding the realistic value of your business. The current state of the financial markets is a big factor, but beauty is also in the eye of the beholder. Different buyers value acquisitions in different ways. Knowing the type of buyer that your company will attract is an important element in estimating its value. There are three major classes of buyers: entrepreneurs, professional (or financial) buyers, and strategic acquirers. Each class seeks different opportunities, and pays based on different metrics. With the financial markets dropping more than 10% between July and August, it seemed appropriate to have Wally Weitz, who embodies calmness and discipline, lecture my Texas Lutheran University students.